Books have the same great content as before and CDs include same number of audio exercises as before, but now are multiformat discs that include computer software for practice and assessment assistance. The DVD portion of the disc includes a 15-min. start-up video specific to each instrument as well as all of the book's audio exercises, and is also a DVD-ROM that includes tempo adjustment software, SmartMusic Software, Finale NotePad Software, Duets and Trios feature, and a Music Listening Library. 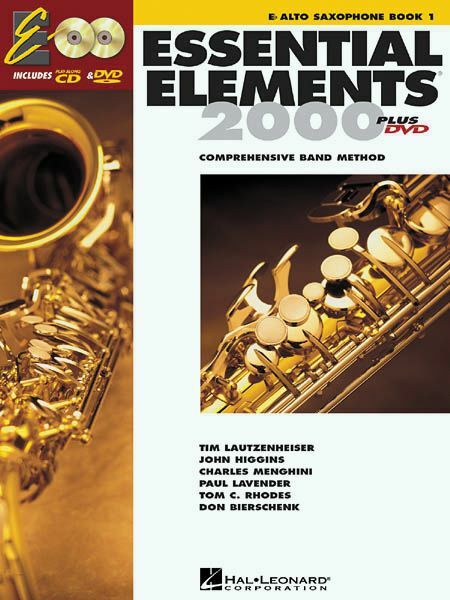 Essential Elements 2000 Plus DVD was written by the outstanding educational team of Dr. Tim Lautzenheiser, John Higgins, Dr. Charles Menghini, Paul Lavender, Tom Rhodes and Don Bierschenk. It combines the very best aspects of the already successful Essential Elements band method with incredible new features that will motivate every band student like never before. Every student receives an instrument-specific play-along disc in their book. These discs include same number of audio exercises as before, but now also include computer software for practice and assessment assistance. The DVD portion includes a 15-min. start-up video specific to each instrument as well as all of the book's audio exercises. It is also a DVD-ROM that works in compatible computers and includes: Tempo adjustment software, SmartMusic Software, Duets and Trios, and a Music Listening Library. Book 1 uses unmeasured long tones to establish good tone production from the very beginning and uses quarter notes to teach pulse and rhythm. By exercise 14 your students will be playing well-known melodies and enjoying the excitement of playing in the band. Book 2 starts with a 14-exercise review of Book 1 - an ideal refresher before new elements are introduced. In both books, new material is carefully paced, sequential, and immediately reinforced. New notes are approached in the easiest ways, then gradually played with wider skips and different rhythms. Each rhythm is introduced as a Rhythm Rap, then repeated on simple pitches, and finally placed in an appropriate melodic setting. It's all right in each student book, correlated with the music and concepts they are currently learning. This is by far the most efficient way to meet the National Standards, integrate other subjects into the music curriculum, and still teach the essentials of music performance. Establish good practice habits, tone and technique with the 2 sets of Daily Warm-Ups included in each book of Essential Elements 2000 Plus DVD. The Rubank Scale and Arpeggio Studies cover 4 major keys in Book 1, and 5 major and 3 minor keys in Book 2, all adapted from Rubank's best-of-the-best to expand your students' technical skills. The additional Rhythm Studies pages include progressive measures of rhythms, which you can use to enhance rhythmic development at any stage. With a quarter note pulse starting in the first lesson, the motivating Rhythm Raps, and plenty of reinforcement, Essential Elements 2000 students learn from new rhythms quickly and easily!